It gets harder and harder to find something new or special from new model releases. As more and more hit the shops and more and more time is devoted by manufacturers to getting a model to work under all the shiny bits up top, so the margin between good and bad models diminish. There truly is little to choose between a lot of models these days as they do the job admirably out of the box. But there is still a compromise between models which run well on plastic magnetic track and those on board. Some of the prime necessities of plastic track models is to carry as little weight as possible and still be as durable and as attractive as possible. The traction magnet will do all the work and the less work there is to do, the better! Fly, Ninco SCX and others all now do a brand of racing model. Basic exterior, low down weight and as little as possible. Some models are ‘weighing in’ in the low sixties as far as grams are concerned! 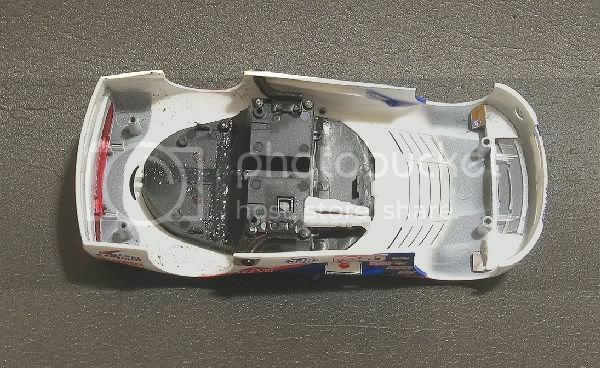 On the other hand, models destined to be good board track racers still need low down weight, but need enough weight to get the tyres to work well and to keep the model flat in the corners. 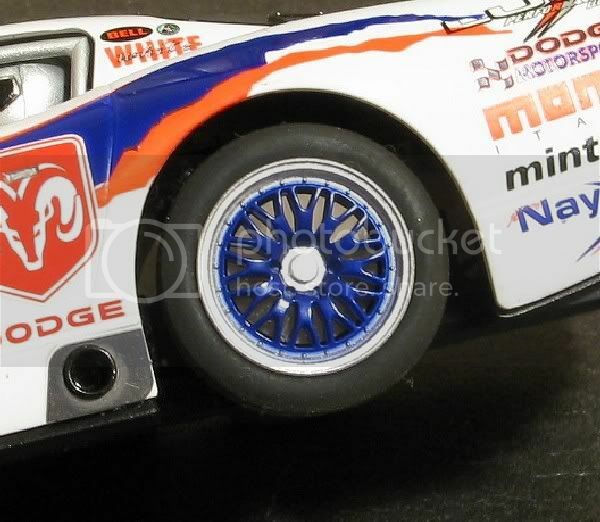 With the advent of new compound tyres, some models are now running at 75% performance of their plastic track cousins. Indeed, I wonder if the wompy hasn’t, or is just about to be reinvented!! 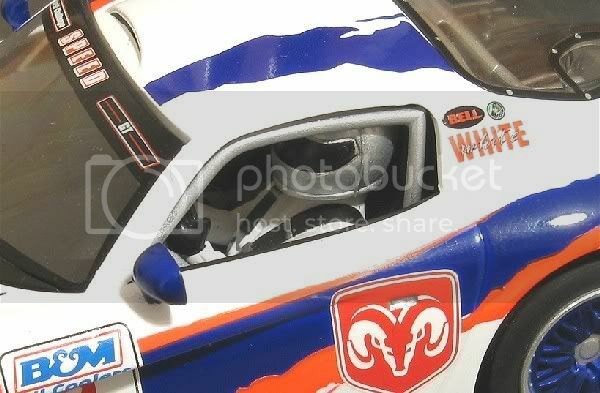 But if you race both media, you still need a separate model for each!! 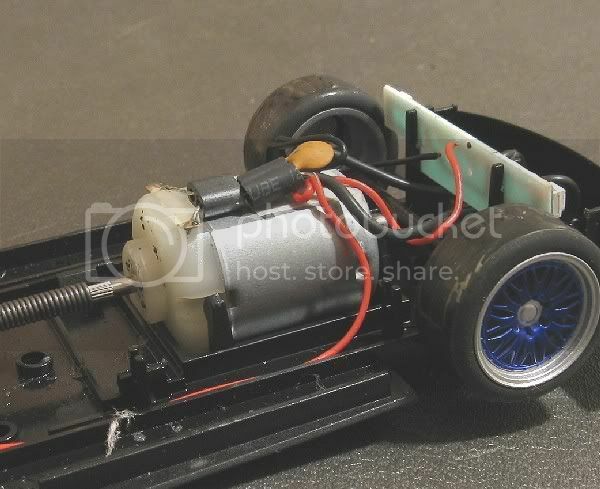 If a model is carrying enough ballast to be a good non mag racer, the odds are that it is too heavy for plastic track racing. It will have reduced acceleration and extended braking distances, and likewise, if you have a champion magnet racer, the odds are that it will be too light to pick up useful traction in corners and on the exit of bends. Some narrower tracked models will even demonstrate their innate ability to roll several times trying. So where do the two meet?? Blowed if I know, but, I have recently driven a model which has narrowed the gap considerably!! 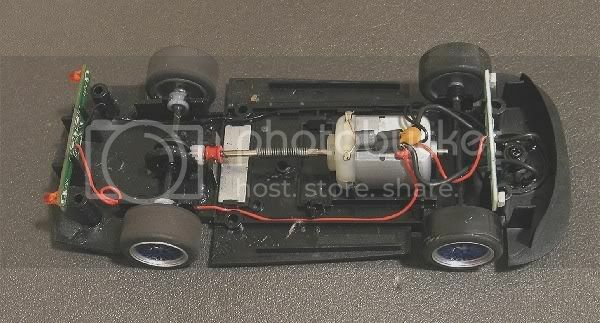 Out of the box it is a magnet track racer, but, even though it has a front mounted motor, it performs extremely well on board! No added weight, no tyre change, just a couple of tweaks on the body screws and Bob’s your uncle! So how does it do it?? Let me tell you what I think!! 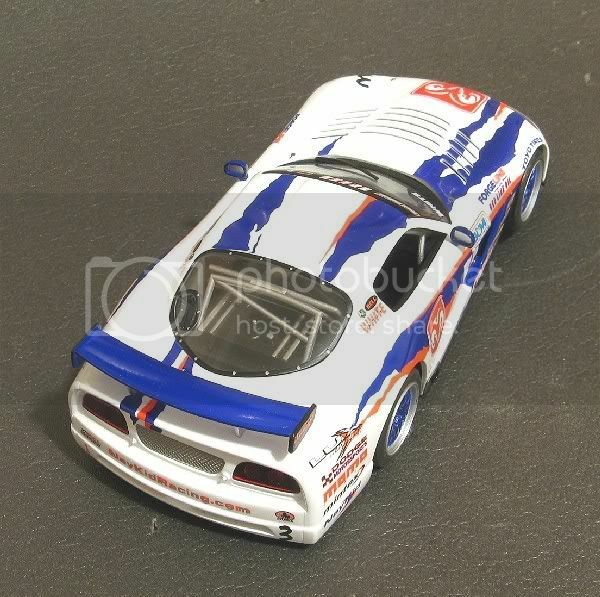 Scalextric’s Dodge Viper starts off by being a balanced chassis. First impressions seem to say that a front motor model must be front heavy, but when you consider that an ‘S’ can Mabuchi only weighs in at eighteen grams or so it doesn’t take a lot of imagination to see the rear end of the model making up the bulk of the weight! So, in this case, the model split is almost 40/60. Now that’s a good start in any one’s book. Not only that, on its first outing the tyres took very little treatment for board track racing and within moments of putting it on the track it was behaving like an old stager. Once on board track it was like putting on an old pair of shoes. Corner exits were controlled and acceleration was crisp and the more it was driven, the more it was decided that this model was going to be a threat once a little bit of time had been spent on it. So where did it stand, SOOB!!?? Rear axle width					61.5 m.m. Guide to rear axle				93.0 m.m. Progress					21.99 m.m. 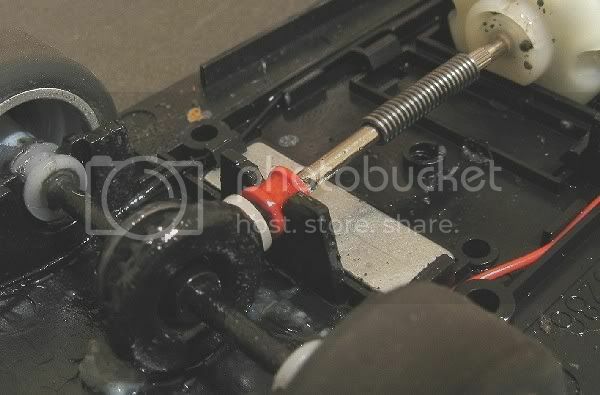 per motor rev. Rear tyre tread width				9.75 m.m. Guide thickness (median)			1.84 m.m. 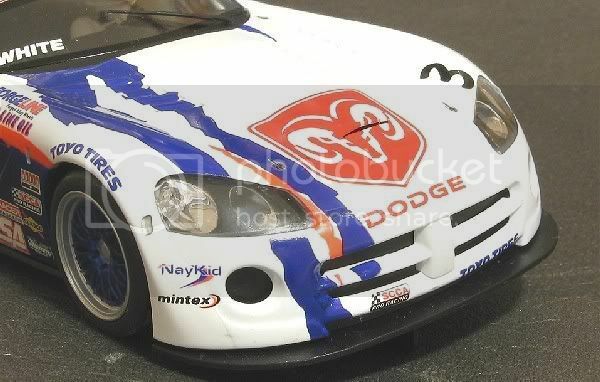 I was unable to get to a plastic track with this model (They seem to be dying out in these parts! ), so for now I must be content with a board track test. As mentioned before, not too far off faultless. In the hands of the right person they could do damage to the results as they come. Once the magic wand has been passed over them I fully expect GT class to be a problem for me (as I don’t have one)!! 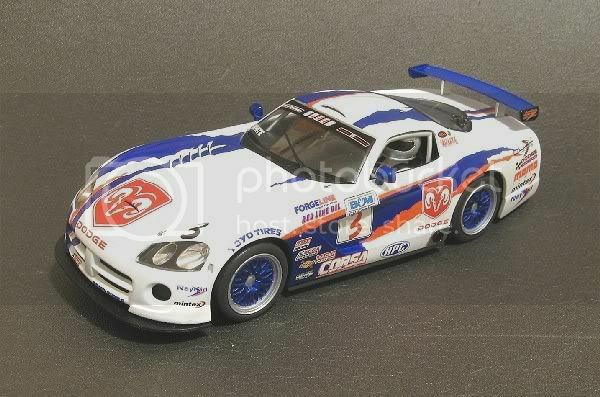 I have had a Scaley Viper for a couple of years, and found that right from the box, the balance was iffy, and it was unpredictable in the turns. In spite of that, I bought another one last week, and ran it hard this weekend on a plastic track of considerable size and complexity. It's GOLDEN! I'm going to have to go through the previous one and find out what is wrong. This new one is great, and has none of the problems of the old one. I am embarrassed to admit that I have been "bad-mouthing" this car for a long time. Just to be sure, when I returned home, I ran the new one hard on my routed track. It may be one of the best cars I have, as an unmodified RTR. I'm going to completely disassemble the old one and check everything. Has anyone out there heard or seen something amiss with the older Vipers? It certainly looks identical with the body off. I'm in the curious position of answering my own post. I found out what has been wrong with my Viper that was bought a couple of years ago. The coupling between the motor shaft and the drive shaft was rubbing the interior. Now, both Vipers run great. Funny I never could find it before, and assumed it was a car that just didn't perform well. My latest buy that ran so well now has a stablemate. Take one step up the 'Slotcar Legends' ladder!